Meets the Gold Cup standards of the Specialty Coffee Association of America (SCAA). The one touch medium and dark roast settings allow you to taste all the subtleties and flavor within these different roasts. 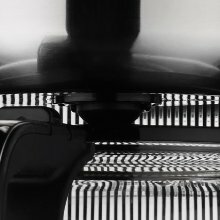 Our new Pour Over Coffee Brewer celebrates the art of manual craftsmanship through automated technology that extracts bright, full flavored coffee. It was designed to mimic the handcrafted manual process baristas mastered, so you don’t have to. 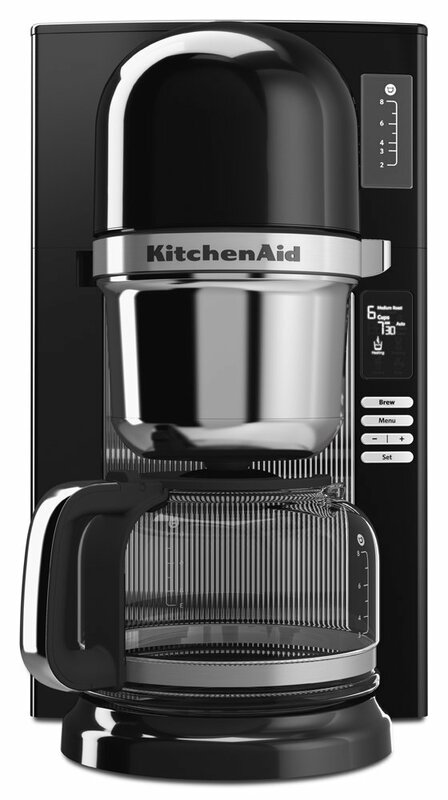 The KitchenAid Custom Pour Over Coffee Brewer combines the flavor and control of the manual pour over process with the programmability and convenience of a traditional coffee maker. Heats the water to the optimal range of 198°F – 204°F at the top of the brewer and therefore minimizes heat loss during the extraction process. 24-hour Programmability. Easily brew 2-8 cups of pour-over style coffee. The unique brewing technology minimizes heat loss during the brewing process. Holds the paper filter in place and provides specific dosage recommendations for the desired number of cups. 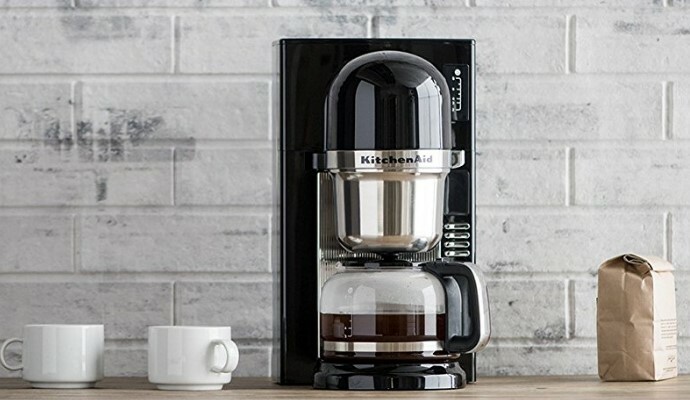 The new KitchenAid pour over coffee maker combines the flavor and control of the manual pour over process with the programmability and convenience of a traditional coffee maker. Pros: Makes excellent tasting coffee. From 2-8 cups. 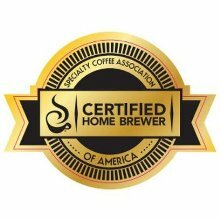 Approved by the Specialty Coffee Association of America. Good looking. Cons: Maximum 8 cups. Works slightly differently than other drip coffee makers. Slightly slower than other coffee makers. NOTE: Please read update at end of review. 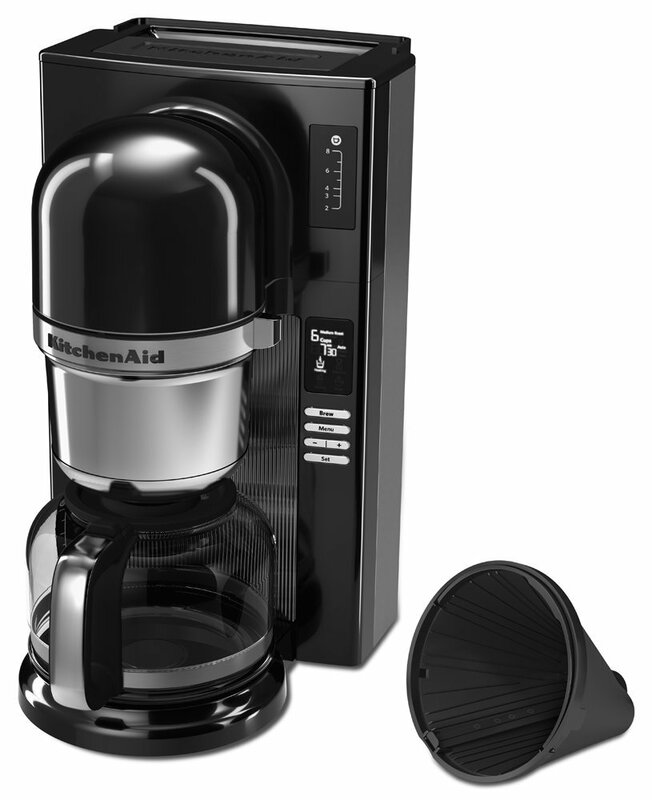 Kitchen Aid has made an electric coffee maker to just make excellent coffee. This device is not really about convenience, or speed, or value. It’s all about a good cup of coffee. In order to accomplish this, it goes about the process differently than other electric drip coffee makers. It’s a little unfair of me to say convenience is not part of the equation here. After all, if you just want to make a really good cup of coffee, a Chemex or a Melitta pot, a tea kettle, a burr coffee grinder, and a paper filter is really all one needs. 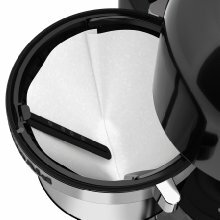 This electric coffee maker has been designed to emulate the steps of a manual pour over process which includes heating the water to a specific temperature, and a gradual wetting of the coffee grounds to allow the flavors to “bloom.” This coffee maker automates most of the steps involved and the end result is worth it. Unlike most other coffee makers, this one requires a bit more pre-meditation. You tell this one about the type of coffee you are going to use, and you tell it how many cups you are going to brew, before you turn it on. It asks whether the coffee you are using is light, medium, or dark roast? Once you set the type of roast, the coffee maker automatically controls the temperature of the water that is best suited for it. This is precise coffee making. The specialty Coffee Association of America considers the best coffee is made with the pour over method using unbleached paper filters. The coffee should be medium roasted beans ground immediately before using. The grind should be even and consistent and slightly finer than medium grind. The ratio of water to coffee should be approximately 10 ounces of water to 17 grams of coffee per two 5 ounce cups. 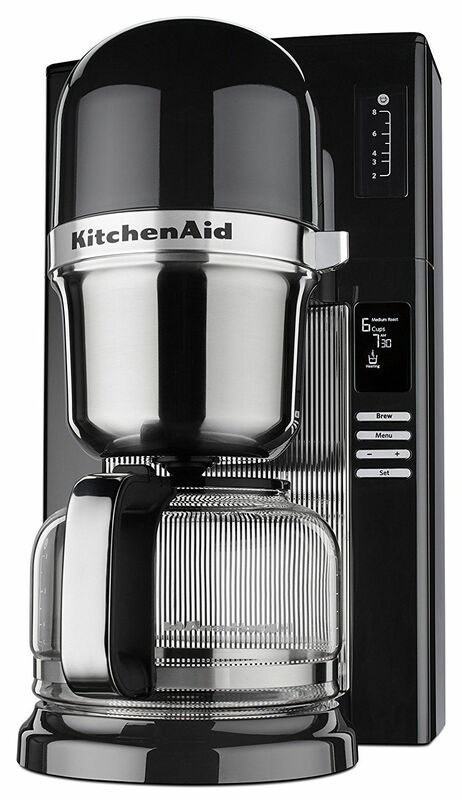 If you think Keurig makes decent coffee, or you buy your coffee pre-ground in a can and keep it around for months, or if you like mild, light roasts or Sanka, this is not a coffee maker for you. 1) The coffee maker is very nice looking in a retro-modern way. It looks very nice next to my trusty Kitchen Aid burr coffee grinder. The “Contour Silver” is a non-flashy, medium metallic grey. 2) It takes #4 paper filters. Melitta filters need to be folded back slightly lengthwise to fit perfectly into the filter basket. I don’t know why this is so. It’s not a big deal, just odd. It comes with a few bleached white filters to get you going. Buy the unbleached, natural brown kind and then fold them a bit to fit. 3) A Melitta gold mesh filter will not fit into the filter basket of this coffee maker. I own one but don’t use it because I prefer coffee made with paper filters…did I mention I prefer the unbleached ones? 4) The filter basket has a “clip” that secures the paper filter and prevents it from accidentally folding over the grounds when the water is pouring. This is a nice feature, but it does extend into the grinds and complicates the cleaning out of the filter at the end of the process because the wet grounds cling to it. The clip also has a raised gage that indicates the level of coffee to be used per cup. This is almost impossible to read when trying to fill the filter and it is much easier just to use the supplied scoop. The filter basket has a handle which makes it easier to remove the basket after brewing. 5) Programming the LED display is very easy. The display is very bright and easy to read without a magnifier. You first set the time, then the type of roast of the coffee, then the number of cups you are going to make. These settings stay until changed. Changing the number of cups is a simple matter of hitting a + or – button. 6) There are indicators on the LED display when the water is heating, when the grounds are being “showered” and when the grounds are seeping. The indicators cycle back and forth until the process is finished. An “Enjoy” light comes on and you hear three beeps. I find that the coffee is still dripping when the beeps are beeping and I have to wait a few more seconds for the dripping to stop. You can remove the carafe during the seeping process without hot coffee dripping on to the hot plate. You might want to try the coffee, but don’t as the coffee is best when it is allowed to brew completely. 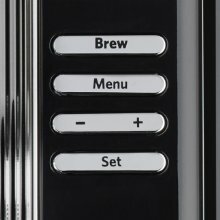 7) The ON/OFF switch is the “Brew” button. When you want to start or stop you press the “Brew” button. 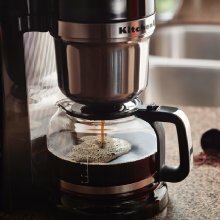 The coffee maker shuts itself off automatically one hour after it finishes brewing your coffee so pressing “Brew” a second time is not really necessary. Coffee is best made in small batches and consumed within 30 minutes of being brewed. It should not stay on a hot plate for a long period of time. There is a hot plate and it does keep the coffee warm, but only for that hour. I find the coffee is plenty warm, and I use milk. 8) As with many other coffee makers, a cup is defined as 5 oz. of water. Kitchen Aid supplies an 8 gram coffee scoop and recommends using one scoop per 5 oz. cup of water. I had been using a 10 gram scoop with my old Braun coffee maker, so Kitchen Aid recommends using slightly less coffee per cup. 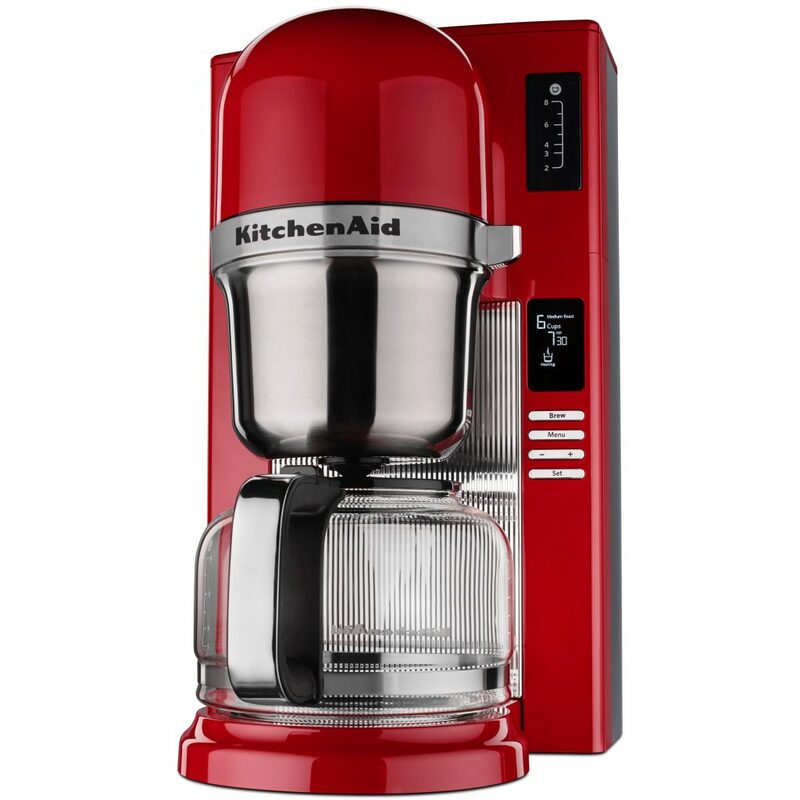 9) Kitchen Aid recommends using just slightly finer than medium grind for your beans. If you want a really good cup of coffee, you should be grinding your beans right before you brew. Pre-ground coffee goes stale quickly. I set my old Kitchenaid coffee grinder to #5.My new DeLonghi to #8. 10) You can pour as much as eight cups of water into the reservoir, however the coffee maker will only make the number of cups you have set on the display. I’ve set the coffee maker to make five cups and it produces precisely five cups. It can be programmed to make as little as two and as many as eight cups at a time. 11) The opening to the water reservoir is horizontal and somewhat narrow and is covered by a sliding door. This is a tall coffee maker, I have to slide it towards me in order to clear the overhang from a kitchen cabinet. This is not a big deal. I’ve had to do it with every coffee maker I’ve ever owned. Pouring water into the reservoir is not difficult. 12) The carafe is glass with a plastic lid that can snap on and off. The carafe holds up to eight cups. The carafe pours easily and does not drip. If it does drip, make sure the lid is snapped on correctly. 13) I have not noticed that this coffee maker takes an unusually long time to complete its brewing cycle. It takes under five minutes to brew five cups. 8 cups takes longer, maybe 8 minutes. Considering this is a slow pour over process, this is entirely to be expected and not objectionable. 14) This coffee maker heats all the water you need at one time, rather than heating the water as it pours. This takes longer to do. The more cups you are brewing, the more water needs to be heated. It takes longer to brew eight cups than it does five. 15) There is an option to “Delay Start” the brewing process. I’ve never used it and probably never will. I’m giving this coffee maker 4 Stars. I’ve only been using it for a week. Let’s hope it keeps to its high standard over the years to come. If it does, it will get the 5th star. There is some trouble in Paradise. The fit and finish of the carafe and the coffee basket is a bit shoddy. -The chrome finished detail of the carafe handle keeps threatening to come lose and rattles a bit. -The long plastic clip that holds the paper filter secure in the basket has disappeared. probably detaching itself while upended discarding used grounds and filter into the trash. 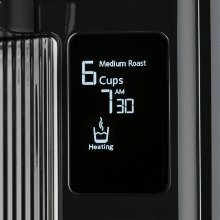 Of more concern, the setting for number of cups to be brewed is not infallible, although this is a selling point of this coffee maker. 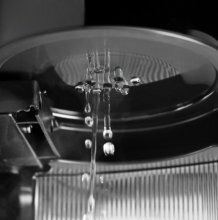 Although set to produce five cups of coffee, sometimes pouring say, six cups of water into the machine produces the requested five, and sometimes it just forgets the setting and produces six too weak cups of brewed coffee. This inconsistency is irritating and has been resolved by unplugging the coffee maker and then “rebooting” the settings or just being careful to only pour the exact amount of water that is necessary into the reservoir. Despite the fact I have only been using filtered water to make coffee, the machine had to be descaled with vinegar in September, three months after first use. This is not really a big deal, just thought I should mention it. I took a leap of faith and decided to give this (relatively new) KitchenAid Pour Over Coffee Brewer (KCM0802MS) a shot. I’m very picky about coffee makers, and oddly enough, nobody seems to make the perfect one. That aside, the price on this one is a bit on the high side, but not too out of line. Time will tell how long it lasts, but after a month of daily, often twice-daily operation… I like it! I looked at all the fairly high-end machines like the Tecnivorm, Wilfa, Bonavita… Seems the higher the price, the less features you get. On/off at the top – really? At the very least, I’d like an auto setting so my coffee is ready in the morning if I do my homework the night before. And in the end, I doubt the coffee will be that much (if any) better. 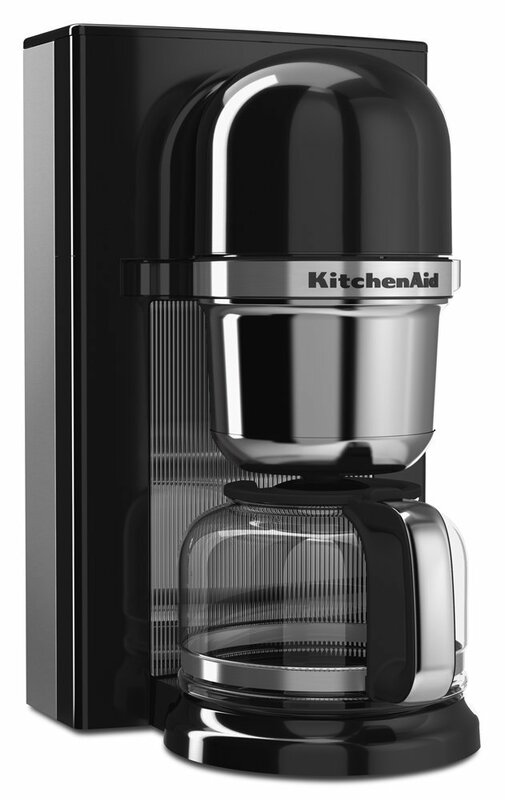 KitchenAid took the pour over approach in a modern coffee maker format and it largely works. The coffee it produces, and what it’s really all about – is darn good! From OTC Dunkin’ Donuts coffee to various Starbucks beans, from blond to medium to dark roast… The coffee is HOT, complex in flavor and with good body. You’re not wasting the “good beans” with this brewer. Sure, it takes a while to brew a pot. 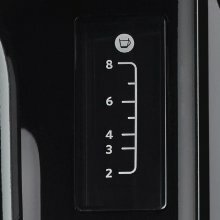 Does anyone believe the pour over method to be fast? If you need a pot of coffee, like, yesterday – stick with drip. Some have complained that the carafe drips all over the place. I’ve never once experienced this – from slow to moderately fast pours. If you’re looking to fill your coffee cup like an F1 pit crew puts gas in cars… You also need to relax a little. To reiterate; yes, it’s slow to brew – as expected, and no, the carafe doesn’t drip all over the place. Honestly, if I had one “major” gripe about this machine it would be the fact that the warmer shuts off after only an hour, rather than two (and I verified with KitchenAid that this is not adjustable, even through a service mode or cheat code). The solution is to just use a separate thermal carafe. The coffee will remain hotter, fresher, longer. C’est la vie. The opening to fill the water up top is curiously small (but many KitchenAid/Cuisinart coffee makers are like this… Don’t ask me what the designers were thinking). The solution there is to pour water in from the side… This gives you a better chance of not spilling as you’re aiming for a 5″ opening rather than 1″ (it’s rectangular). At only eight cups max, this is a bit less than I’m used to… But if it helps any, they run on the large side. You could almost call this a ten cup. My last gripe would be the lack of an “AUTO” button. In order to set it up at night for the next morning, assuming you use the same time setting – you have to hit MENU MENU SET SET SET. Still, it’s better than a high-end (yet utter POS) Krups unit I had which required a basic understanding of hieroglyphs and programming. You get used to this, obviously, but a single button would’ve been nice. Back to the pros… Easy to use, easy to clean. Looks sharp on the counter! Most importantly, it makes a darn fine cup of coffee, and the medium/dark roast selector does make a difference (f you like to change up your beans, use the appropriate setting). I placed my coffee maker on a slide-out pad atop the counter, which makes sliding it out from under the cabinet a total breeze and helps a TON! You can pick one up at BB&B or here on Amazon for about $15. I’m a coffee snob, and I like my KitchenAid Pour Over Coffee Brewer – as I suspect you will too! UPDATE (June 2016): Out of the year of ownership thus far, the last couple of months I’ve experienced sporadic water leakage through the bottom of the unit, such as when set up the night before to come on in the morning automatically. This problem went away by itself, then came back again. Since the initial ocurrence I just kept two folded paper towels under the unit. However, when it came back it was just bad – easily soaking the paper towels. I first emailed KitchenAid, but they suggested calling instead. So I did that, wasn’t on hold for more than ten minutes before speaking to someone and both quickly and easily arranged to have a brand new unit shipped to me (the old one will be sent back). I have to say, the service/support experience was very good and resolved to my satisfaction! Curious, I asked, and the rep. has not heard of this happening to anyone else. Otherwise, I’m still very happy with the unit as well. Dependable, excellent coffee.